This past weekend, I received an unusual gift. My dear friend Molly and her husband Mark had just spent the entire rainy weekend (thank you, Hurricane Joaquin) moving all their worldly possessions into their new house. When we visited them Sunday night, I noticed a bunch of glassware in the kitchen being staged for their new places within the cabinets. 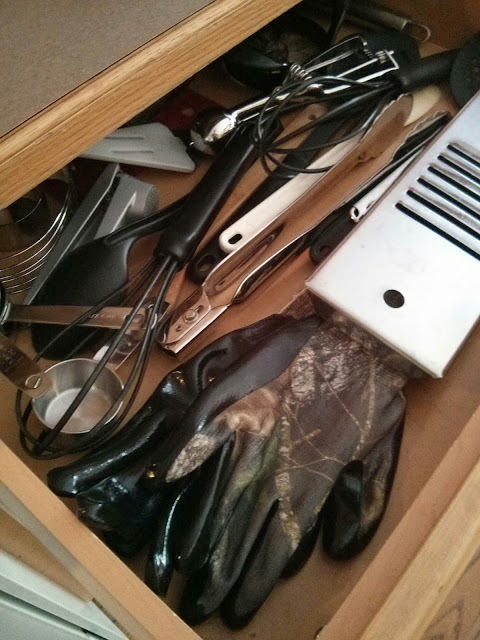 I hadn't remembered packing sets of camouflage gloves, though. While we were eating dinner, she said, "Oh hey, I have something for you." She handed me one of the pairs I'd just seen on the counter. As I examined them, I noticed the palms were completely coated with silicone. "They're for when you need to get a better grip on something," she said. While we'd packed her belongings over the summer, we'd struggled to lift awkward-shaped cardboard boxes and other gangly items; she knew I'd appreciate them. Molly also has rheumatoid arthritis, and one of the side effects is the inability to get a firm grip on things like jars. When I glimpsed these in my utensil drawer today, I was touched by her kindness. She knows me and my desire to have a firm hold, not only on boxes, but life. I'm thankful every single day for her presence in my life. She is so generous--not only in gifting me with those glove. She shows me how to let go of daily parenting as an empty nester and a reminds me Whose Hand to reach for when life seems to be giving me the slip. Love you, Molly! Has someone ever helped you get a grip? I'd love to hear your story today. Thank you for a post that speaks to my heart in so many ways. I know first hand how hard it is to open jars and hold on to things. And like you I want a firm hold on life as well. My husband Bert has helped me to get a grip. He is a counselor and his ability to listen and help me sort out all of the swirling feelings helps me take a breath and get perspective. He recently had a huge health scare (a TIA mini-stroke) and I realized even more how his kindness touches me every day. I'm so glad you have Molly in your life! It's a treat to read your blog posts. My husband as been a source of perspective, grace, and unconditional love and I am so thankful for him. Hope Bert is recovering and that you have sensed the Lord's presence during this time. As an RA person, I'd love to know more about the gloves! Do you have any idea where she bought them or the brand name? This is often a need for me! Great analogy with life, too. Welcome,GrammaGrits! The gloves are by Mossy Oak and I think she bought them at Home Depot. I checked online but couldn't find a link at the Mossy Oak site. Thanks! Found some of the gloves on eBay.